It’s 3am, my room is pitch black, I’ve got my noise-cancelling headphones in, and I’ve just finished watching The Babadook. 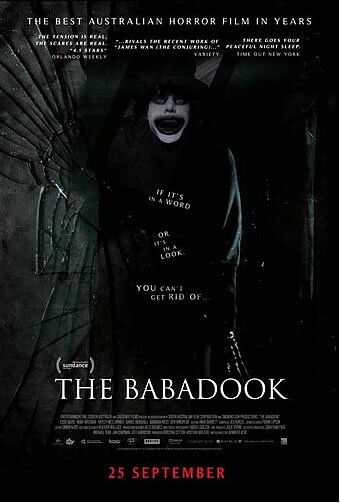 I had heard all sorts of praise for Australian writer/director Jennifer Kent’s horror movie The Babadook since it was released at the end of last year, but I was still sceptical since I don’t find many horror movies satisfying. The truth is, The Babadook isn’t really a scary movie. Instead it is a fascinating and an extremely well made psychological headspin that will get under your skin and unsettle you at your very core. Unfortunately the film does suffer from a few frustrating flaws – most notably in its writing – but these should not discourage you from taking the plunge and letting The Babadook into your home. The premise of The Babadook is fairly straightforward and nothing new for horror movies: widow and single mother Amelia (Essie Davis) is struggling to cope with her troubled son Robbie’s (Noah Wiseman) fear that monsters live in every corner of their house when she comes across a story about the sinister spirit of The Babadook and her life starts to fall apart. Fortunately Kent manages to rise above tired horror tropes and masterfully delivers the captivating experience of watching Amelia struggle with hate, grief and loneliness as she tries to deal with her son’s fears and the presence of The Babadook. You won’t find any cheap jump-scares or hair-raising gore in this film. Instead, you’ll be treated to some of the best tension and unnerving horror of recent years thanks to some excellent performances, creative editing and a chilling score that really makes The Babadook a fresh and captivating experience. While the tone, tension and overall film making in The Babadook really help to create a wonderfully tense and psychologically challenging experience, the film is let down by some significant flaws in the writing. I don’t want to spoil anything plot-wise, but I do have to say this: Amelia’s son Robbie is possibly the most annoying child character in cinematic history. I’m talking that bratty kid at the shops who throws a tantrum because his mum won’t buy him an ice-cream times one thousand. Yes, I know Robbie is meant to be deeply affected by the absence of a father figure, but the character is so unlikable that it almost stopped me from caring about the family drama and tension that surrounds most of the plot. It also didn’t help that Robbie was given some very awkward expositional dialogue that no 7 year old would ever say. Thankfully, Amelia’s journey and struggle throughout the film really had me invested in the story and intentional or not, my hatred for Robbie had me torn between wanting to see The Babadook wreak havoc on the family and wanting to see Amelia triumph over her grief, which added to the overall tension of the film. A very creepy movie. But also quite emotional because of the humane story-line at the center, which is probably where most of this movie works. Nice review.